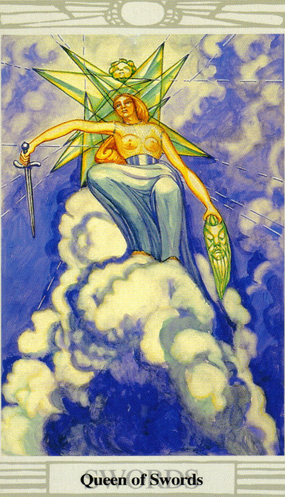 The Queen of Swords – Queen of the Sylphs & Sylphides. Meditation pattern: Place 10 of Disks, 2 of Swords, and 3 of Swords side-by-side, with the Queen of Swords above them. Below the two Swords, place Atu VIII, Adjustment. Traditional Description: A graceful woman with wavy, curling hair, like a Queen seated upon a throne and crowned. Beneath the throne are gray cumulus clouds. Her general attire is as that of the Queen of Wands; but she wears, as a crest, a winged child’s head. A drawn sword in one hand, and in the other a large, bearded, newly severed head of a man. HEH of VAV (WATER of AIR): The watery characteristics of Air are its currents and flow, not the unyielding temper of the sword’s steel. Heh of Vav represents Neshamah functioning in the mental world of Yetzirah. She is hunches and insights more than hard fact. She has no shortage of conviction, nor lack of precision, but is perceptive of pattern more than particulars. When heeded, she represents the willingness of the egoic intellect to respond to hunches and intuition. on the plane of mental dialectic, but their differences will not be whitewashed nor set aside. the consciousness of Heh into our very human intellectual and reactive minds. She also partakes of the last decanate of Virgo, ruled by Mercury and called WEALTH; yet this is her shadow, her nemesis. Hers is not the way of the finished product. The child she nurtures is a work in progress. Hers is not the practical management of completed affairs but, rather, the ongoing brainstorming of creative solution. The potential is always in her, the possibility of simply autocratically administering “what’s so” as a fait accompli; but in this, she becomes more Sword and less Queen. She loses her timeless perspective. In divination, the character is intensely perceptive, keen in observation, intuitive, subtle, quick, precise, and confident; often persevering, accurate in superficial things; compromising and adaptable, yet without being abdicating; graceful, fond of dancing; yet sorrowful and alone. (May indicate a widow). If ill-dignified: cruel, severe, autocratic, alienated, grieving, alone; sly, deceitful, stubborn, unreliable, though with a good exterior. - There is a wonderful mix of abstract and practical in her! But she seems overall more interested in Ideas: Justice primarily, and Truth in connection to it. - She measures and weights, and then – cuts without remorse what is superfluous. She thus operates as Intuition in the realm of the ego-mind and intellect; she is the factor that purifies the mind. - Seeing the two opposite sides of everything is her virtue as well as possible source of her troubles – portrayed by 10-of-Disks as her shadow side: if she is concerned with the results/effects of the process of weighting she is and does, she won’t be able to neutrally approach the phenomenon she measures. - Her job is to observe and note: is there a disbalance, is there a deviation from the subtle golden thread of balanced motion? - By her impartiality and her ability to see both sides of the coin in every situation, she makes a perfect advice-giver. Through observing, she notices patterns, and in this way gains knowledge, which she strives to share with others. She is disciplinarian, firm in decisions, respects Time and its laws. - At her highest, she represents Dhyana in the practical every-day dynamics of existence. - Concentration, calmness, long-lasting orientation of attention to a particular phenomenon. Awareness of the importance of Time, actions with confidence in it; neutral position, objectivity, tendency for systematic approach to things. - Good (precise, astute) judge of people and characters; mind highly developed. - Rules, norms, regulations, prescripts…their essence is in keeping the order of law which protects the society/community and exists in service to its members. This Queen represents that level/area of consciousness; she sees an individual as a part of the collective, understands events and happenings through seeing their function in reference to a wider whole they are a part of. - Shadow side, 10-of-Disks: to materialize is not her task; she does not do her job well by taking the 10-of-Disks as her frame of reference, because her real frame-of-reference are Supernals (2-of-Swords, 3-of-Swords), Balance as Law and Principle, without bias, without concern for any personal preferences of whatever particular side, etc. - While her “sister”, Queen-of-Cups, is pure Intuition as such, this Queen is the Speech-of-Intuition, that same faculty (Heh) expressed in the sphere of the rational mind. - She is the “cold” and detached expression of Beauty, perceived by the mind as Truth.